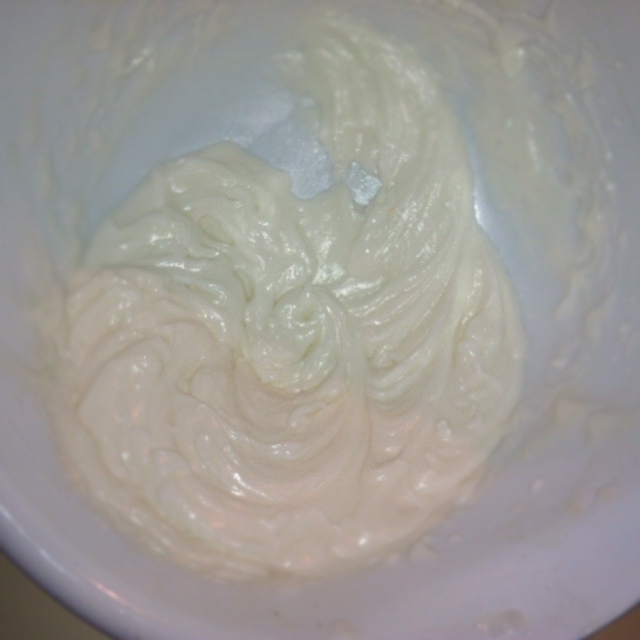 this is the same recipe used to make the whipped shea butter for hair. I’ve been using this for months now. I tried it with mango butter but it doesn’t stay whipped so I’m going back to using the shea. I’ve seen some recipes with mango butter and it seems like it would smell so good. What happens? Does the mango separate or does it get hard? I want to pass on a secret that my Mom shared with me as a child for keeping your skin smooth soft and moisturized no matter what the season winter spring summer or fall. I use to use Baby Oil for years but once I dreaded my hair I started making my own oils which usually consist of Olive Oil, Apricot Oil, Coconut Oil, Grape Seed Oil, Jojoba Oil, EO’s Rosemary, Sage and my favorite EO scent which is Jasmine. I use it on my Dreads as well as my body. The key to ensure that your skin is always baby soft is to put your oil on while your skin is wet. So after your bath put on your oil, after your shower put on your oil. For those of you that don’t like an oily feeling you can softly pat your skin with a thirst towel prior to putting on your clothing. Since I was raised on this theory I don’t take off the excess unless my outfit demands it………….ie I’m wearing something silk or maybe a tight pair of jeans (we love those skinny jeans…………lol) I love the way my. I can tell that I always get compliments on the way my skin feels, and the only time I had a issue with dry skin was during the time that I was stationed in Germany. 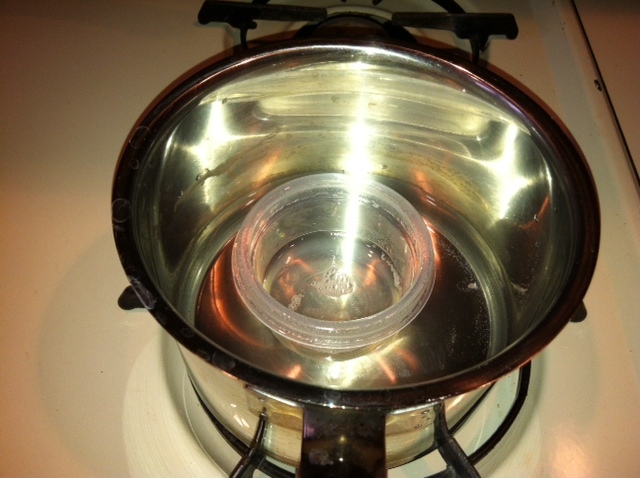 All I had to do was adjust my recipe (I added more Grape Seed oil) and it was on an popping……lol. If any of you ladies would like my recipe just let me know, I’m more than happy to share it. Romaine, I was applying my coconut oil body whip straight out of the shower, doors closed so it stayed steamy … blotting lightly with a towel to leave water on my skin, still, ALLIGATOR SKIN!! I tried a shea butter, cocoa butter, coconut oil, vitamin E oil mix, still dry as the Sahara by the time I got home from work, skin itching/burning when I lay in bed :(. I’m still willing to try other combos though and was going to try grapeseed oil, mineral oil and maybe glycerine. I feel like I may need water in my mix, but that means I’ll need to add a preservative. But, I was thinking first I’d experiment with mineral oil as it’s a great sealant and I was thinking it might help seal in the water and oil. But again, would love to know your erecipe … though, that’s a lot of oils!! LOL!! I’m, like, a three/four ingredients max type of gal unless I already have it in the house! Actually, I may have everything you listed but the sage EO though!! LOL!! So, yeah, recipe please!! LOL! I’m hella jelly at your employees tho hah. What a cool gift! 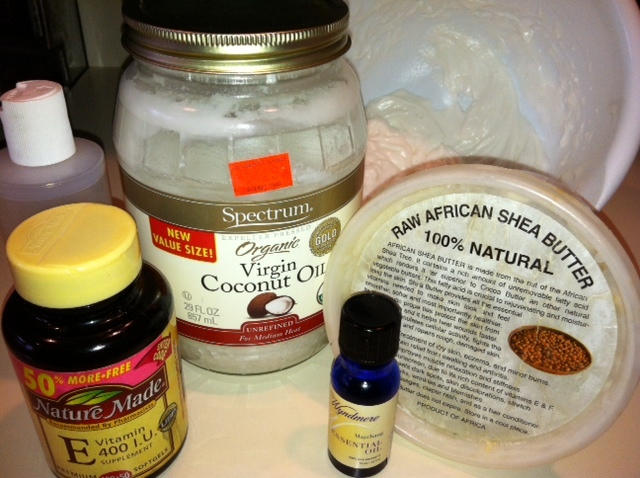 Will you also use this recipe for hair or its exclusively for skin? LOL!! I’m glad that you like it! I hope that they will too!! I still have to get the coconut oil though!! I’m hitting TJ’s today to pick up several!! Oh, and my intent was just to use it for my skin … but, I’ve used it on my ends a few times too!! LOL! This would make a great gift for my extended family! That’s what I’m thinking too Tiffany. I’m keeping a few of the larger jars to make some family gifts!! Girl, welcome to my world. I’ve been copping those small vanity Mason jars from Walmart the last 2 years. 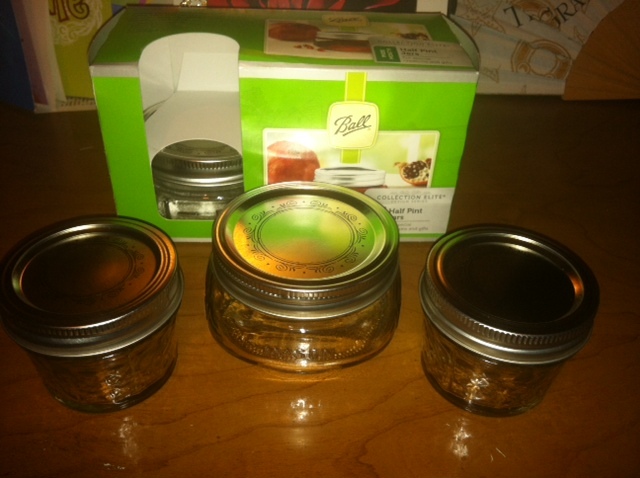 I use them to store my “Erica butters” (body/hair) and also my DIY body scrubs. They last forever. I use them as gift containers for my Mom, friends and co workers. Coconut, jojoba and avocado oils are my winter holy grails for my skin. I customize them with other oils, but they are my base oils. For my scrubs, I tend to use sugar and white corn meal as exfoliants with my oils. They are ridiculously cheap and just as effective as these expensive body scrubs. LOL @ welcome to your world:)! I’ve heard avocado oil is good for hair and skin too. I don’t think they’ll make it in this batch, but I might be experimenting with other oils including that, jojoba and the grapeseed oil that MrsNumbles talks about below!! I’m too lazy to do scrubs, so I use those scrub gloves daily. Feel like I get sufficient exfoliation, though a scrub every now and again would probably do a body good!! While visiting a skincare forum I was informed by the ladies there that just like oils and butter don’t moisturize hair they also don’t moisturize the skin just lock in moisture which is probably why the vaseline is the only thing that works for you. They recommended putting on a body butter right after the shower or lotioing with a water based product and sealing just like hair! Coconut oil is actually one of the few oils w/a molecule small enough to penetrate the hair cuticle and moisturize from within. That’s why many pre poo w/it. But as to most other oils and butter, yes. That’s why I would apply to damp skin post shower, but the store bought oils and butters still weren’t helping:(. So far, so good w/my whip though! 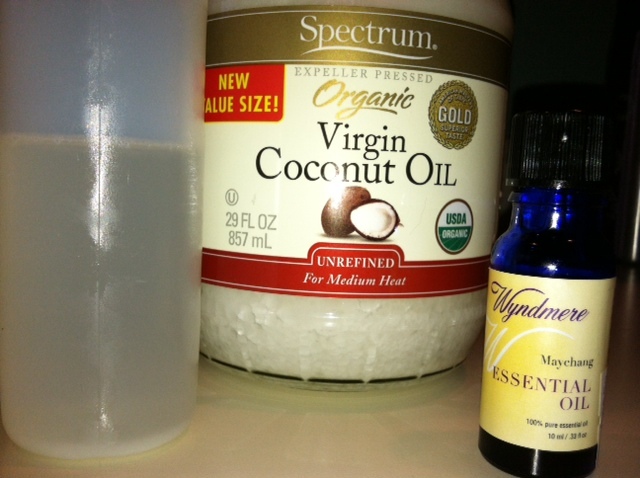 You just reminded me of my old winter staple – coconut oil, grapeseed oil, and orange EO! Best thing for me in the winter, hands down. I figured being in a slightly warmer climate now(in London now, but I used to live in Bergen County, NJ – shout out!!!) would negate the need for it, but I just found my first skin crack yesterday and it hurts like an SOB…..so guess where I’m going this weekend? *LOL*Thanks again, however inadvertently! YES!!!! Thank you for acknowledging my JN reference MrsNumbles!! That made my day that someone got it and mentioned it;). LOL!! The orange oil isn’t irritating to your skin? I was a little afraid that it or lemon EO might be, b/c I thought I recalled reading those oils may cause skin irritation. But, I love citrusy cents, orange, grapefruit, lemon. And Woot, Woot, former New Jerseyan in the house!! Hope that you got to your skin in time!! One of the channels I miss most is Nickelodeon – no FairlyOdds over here at all, ugh! *LOL* The orange EO never bothered my skin at all, and I’m allergic to a lot of stuff…probably because it’s so well diluted in the carrier oils. And I finally ended up in a store that sold EOs and I finally saw maychang! It didn’t have a tester so I didn’t get a chance to sniff so I picked up grapefruit this time; love it even more than the orange. And my skin is very happy – it’s keeping away the eczema that likes to crop up behind my knees during the winter, too! Don’t sleep on this ladies! I whipped up my own batch, added a couple of things and an alcohol-free vanilla fragrance and it has made my skin (which is ALWAYS dry, even though I lotion up everyday) unbelievably soft and supple. Thank you hairscapades! Okay, I’m really going to have to do this soon – thanks for the feedback! I know I’m super late to the party, but after seeing this post I’ve been keeping my eye out for low-cost coconut oil. 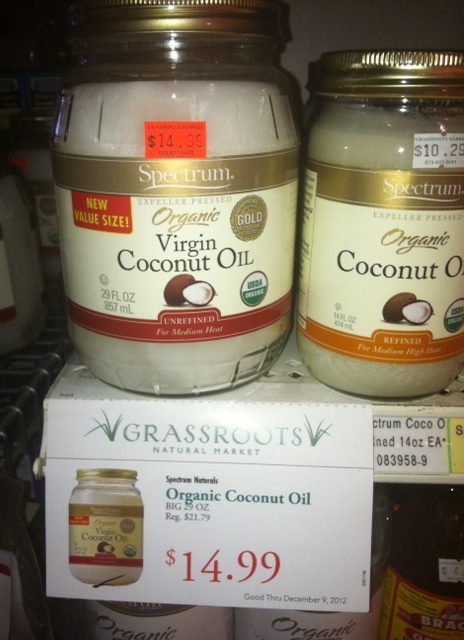 JSYK, I picked up a big ole 58 oz tub of 100% pure, unrefined, organic extra virgin coconut oil at CostCo for $16. Never seen it there before, probably will never be there again. Score! I’m going to Costco tomorrow morning, thanks for the tip. Okay! SO I am going to make this and the flax seed gel cream TODAY on my day off! YAY! I am so excited… I have some rose oil so I am thinking I am going to use that and my hand mixer – the only thing I am missing is the shea butter. 😦 I may have to go out for it, but was wondering if I used some of the oyin handmade whipped pudding in its place would that work?? This looks great. I’m excited to try it!! where did you get the raw african shea butter from?